I hate being sick on the weekend. I really hope I feel better tomorrow so I can go to work. I'll bet you never expected me to say that, but I have to get a few things accomplished that I won't have time for come Monday. It's going to be a very busy few months at work even though I don't have to go out of town again for about a month. But I won't bore you with any more of that. Since I was stuck at home I've spent a good portion of today uploading even more New Zealand photos! I created the Kaikoura, NZ 12/27/08 album for the pictures we took while hiking and whale watching in Kaikoura. It's such a beautiful little seaside town on the South Island and we loved the day we spent there. I also created the Canterbury, NZ 12/28/08 album for our pictures from the Lord of the Rings tour to the Edoras filming location. The actual filming site is on the Canterbury Plains which are inland from Christchurch. Such gorgeous countryside! If you don't already know, Dan and I care planning another trip to New Zealand for next December/January. We just love it there! Just a view from the side of the highway in New Zealand! 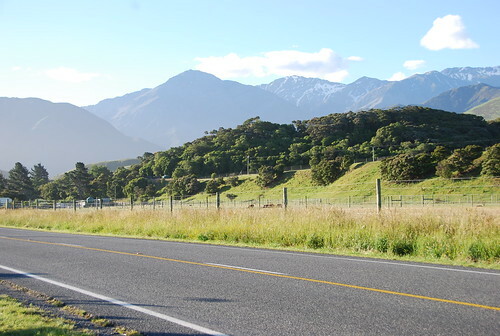 I took this picture while Dan and I were on the road to Kaikoura on New Zealand's South Island. The Southern Alps are just gorgeous! See this and other photos in my now complete Interislander and South Island 12/26/08 album. 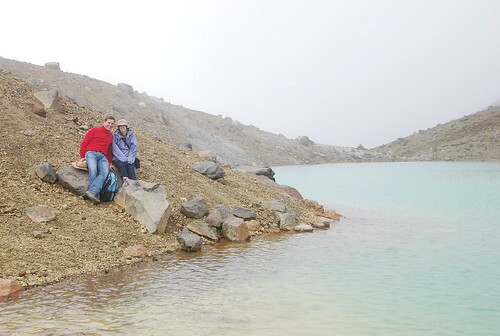 I've spent the last couple of hours uploading photos to my Tongariro Crossing 12/25/08 album and I'm finally finished! We took a lot of pictures on the Crossing. I started uploading photos to a new album, Interislander and South Island 12/26/08. So far it only contains pictures from our journey on the Interislander Ferry between Wellington on the North Island and Picton on the South Island. The next time I get a chance I'll add the pictures from our drive along the coast from Picton to Christchurch. The black sand beaches are gorgeous. I'm ecstatic that my laptop is operational again. This is thanks to my brother-in-law Bryon who reinstalled Windows (using the six year-old Dell CD-ROMs that I never thought I'd need, but kept through three changes of address anyway) while he was here. I was pretty sure this was the only thing that would fix the symptoms my laptop was exhibiting so I backed up absolutely everything on it. Or at least I thought I did. Photos? Saved on an external hard drive. Music? Backed up on a couple of CDs. But after it was too late I realized that I had eight years of emails on my old account that are now gone forever. Not that I'll ever need them again, but my wedding planning correspondence was in there and I'm kind of sad it's gone. Being able to download movies for my iPod Touch makes it very easy to for me to overlook the lack of old and practically forgotten emails though. In fact it's awesome! And thanks to a birthday gift from Dave and Sam I can stock up on movies (mostly chick flicks that I can watch why flying back and forth from DC) at no cost to myself. Thanks to everyone who made this possible (i.e., Bryon, Dave, and Sam)! Happy birthday Dan! Right now I'm at the Dulles airport getting ready to fly home to you! I can't wait to see you. I've been gone eleven days and I am so ready to get home. I love you, my wonderful husband, and I will see you soon. I'm in the middle of another crazy business trip, and since this one is longer than usual it has a greater chance of wackiness! Case in point, on Thursday afternoon as I was getting ready to go to work for the night my rental car wouldn't start. Fortunately my hotel is within walking distance of work so I didn't have to call roadside assistance that very minute, but I was very annoyed that the car I rented two days earlier was giving me trouble (all signs pointed to a dead battery). Friday was my day off from work (yay! ), but I had spend some of my free time dealing with the stupid car (boo!). I guess the problem really was just a dead battery because roadside assistance just jump started it and everything has been fine since. I've been told that cold weather isn't too kind to car batteries and the high on Thursday was only 24 degF. Since my car was fixed (at least for the time being) I drove up to Maryland to have dinner with Dave and Sam. I am an extremely nervous driver, especially when it's somewhere I haven't driven myself, but I made it to their house with only a few wrong turns on the way (and fortunately none of those were on major highways). We dined on fried chicken, macaroni and cheese, collard greens, and cornbread. A very sophisticated meal! Actually it was delicious food that I would highly recommend if you're in the Silver Spring area. The macaroni and cheese was fantastic. I got way more lost driving back to my hotel that I did on the way to Dave and Sam's house. I couldn't figure out which exit I was supposed to take off of the Dulles Toll Road so I eventually ended up at the airport. I felt really dumb, but I've driven from the airport to my hotel so many times that I was absolutely sure of the way once I got there. And now I'm spending a few hours at work getting caught up on emails. I start my 1 to 10 AM shifts tomorrow so I'm trying to acclimate myself to these hours ahead of time. This isn't going to be easy. I'm tired already. I'm back in DC again after a little drama this morning. I overslept by an hour and would have missed Supershuttle all together if they hadn't called at 3 AM to tell me the shuttle would be late. Thanks to all the packing I did yesterday I was able to be ready to leave at 3:30. It was extremely stressful, though. My first shift starts at 4 PM tomorrow so I have some sleep adjustment/catching up to do. I'm tired and I miss LA already. Especially my wonderful husband. Dan and I saw this New Zealand commercial on TV one night and it made us both tear up a little. We are already planning to go back next winter. I've run into another one of those periods where I can't seem to find the time to keep my webpage updated. My job has been keeping me insanely busy these past couple of weeks (including a trip to DC from the 21st to the 25th), but I am now enjoying a rare work-free weekend. Today is the first day I haven't had to work since January 17th. Unfortunately I have to leave for DC again on Monday so I'm doing my best to take advantage of the weekend while it lasts. That being said, I finished uploading photos to my Tongariro National Park 12/24/08 album and started a new album called Tongariro Crossing 12/25/08. There are only a few pictures there now, but they are some of the most beautiful of our trip. On Christmas morning when Dan and I were preparing for the Tongario Crossing we got our first opportunity to see Mt. Ngauruhoe, aka Mt. Doom from Lord of the Rings. It was spectacular.